Kol ishah is the singing voice of a woman, and something observant Jewish men are forbidden to hear. Too bad for them, because they are missing out. They are not listening to the voices of today’s Jewish women rock musicians, something that even those of us who do not observe kol ishah did not have the privilege of hearing until recently. Back when I was growing up there were American female rockers who were Jewish, like Pat Benatar, and there were Israeli women rock singers. Girls (and the rest of us) today, however, can look up to young American women who not only rock out, but do so to lyrics that incorporate traditional Jewish liturgical texts, make references to biblical narratives and convey authentic Jewish values and messages. 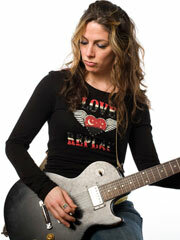 Musicians like Chana Rothman, Naomi Less and Sarah Aroeste aren’t merely rockers who are Jewish. They’re Jewish rockers. It is also exciting to see how these singers naturally and seamlessly switch between English and Hebrew in their songs. Chana Rothman, whose songs I find to be exceptionally intelligent and well written, does this especially well. This singing in multiple languages within a single song also seems to be a trend among Israeli women singers like HaBanot Nechama and Yael Naim (who sings in French, as well as English and Hebrew). I like this fluidity and breaking down of boundaries, which I have a feeling has a lot to do with the far more globalized world young people live in today. As Jewish as I was growing up, going to Jewish day school and spending summers in Israel, I somehow had to compartmentalize my life when it came to music. The Canadian me listened to rock music (Culture Club, Tears For Fears, Bryan Adams…What can I tell you? It was the ’80s), and the Jewish me listened to either old-fashioned Hebrew and Yiddish folksongs, or contemporary Israeli pop tunes. It was a musical case of “never the twain shall meet.” It’s generally not the healthiest thing to compartmentalize parts of your life, even your music listening habits. So, as strong as my childhood Jewish identity was, there was something missing. What was missing was the full integration of my Canadian self with my Jewish self. It never occurred to me that you could express the stuff of top 100 hits, like love, lust and heartbreak in explicitly Jewish music. Neither did I think that you could rock out about God, questions of faith and Jewish values like tzeddek (social justice). It is thrilling for me as a Jewish parent and Jewish educator to learn that young people today don’t even think twice about whether they can or should weave it all together. Male musicians, like Rick Recht, have been doing this musical melding for some time now. But it is only more recently that Jewish women rockers have taken center stage. It is true that they stand on the shoulders of such giants as the seminal Jewish folk singer-songwriter Debbie Friedman, but it can’t be ignored that performers like Chana Rothman, Naomi Less and Sarah Aroeste are doing something new, different and huge in its own right. I may be a bit older than the average audience member at these artists’ concerts, but that isn’t stopping me from downloading their music to my iPod and dancing around the house to it. Heck, I’m even considering ordering one of Naomi Less’s “Jewish Chicks Rock” t-shirts, or maybe a “Ladino Rocks” one from Sarah Aroeste’s website. I’m going to pass on the tank top models, though. I’ll leave those for the real rockers to wear. That’s because they have something I don’t…beautifully toned biceps from playing the electric guitar. This entry was posted on January 31, 2010 at 3:43 am and is filed under Calling All Jewish Educators!, The Jewish Past, Present and Future, This You'll Want To Hear. You can follow any responses to this entry through the RSS 2.0 feed. You can skip to the end and leave a response. Pinging is currently not allowed. Nice article. I’ve just discovered Jewish bluegrass (“Jewgrass”) for those of us south of the Mason-Dixon, so the integration and de-compartmentalization is going all around. Hooray! You might be interested in an article I just wrote: “A New Hearing on Kol Isha“, http://www.jewishideas.org/articles/new-hearing-kol-ishah. Michael, thank you very much for your comment. I will definitely need to get my hands on some “Jewgrass” recordings to take a listen! Also, thank you for linking to your article on kol ishah – it is fascinating, and with it you have introduced me to the Institute for Jewish Ideas and Ideals. My pleasure! I like to advertise the Institute as much as I can, so it pleases me greatly that I’ve succeeded in this case! As for Jewgrass, you might start with “Shalom Feivel and the Rocky Mountain Jewgrass” at http://www.rockymountainjewgrass.com/. By the way, the Institute (headed by Rabbi Marc Angel) is Orthodox. I say this because I just saw your Facebook profile, and now your “So Tell Me, Just Who Exactly…”, so I saw you went to JTS. I just want to be sure you don’t misunderstand. That said, Rabbi Angel is certainly not your typical Orthodox. (Neither am I, but that’s another story.) Firstly, he follows mostly Turkish/Balkan Judeo-Spanish Sephardim, who have far more in common with the pre-Expulsion Spanish Jews than they do with Ashkenazim. (German “enlightened” Neo-Orthodox Judaism – think Rabbi S. R. Hirsch – is also indebted to Spanish Judaism.) The Spanish Jews (whether of the Western European or Ottoman varieties) haven’t forgotten their cosmopolitan roots, and their form of Judaism is a far more humane/compassionate and intellectually-enlightened form than the Ashkenazi one. Rabbi Angel’s own rabbi, Rabbi Haim David Halevi, for example, was strictly Orthodox, but managed to be quoted widely by Reform poseqim, because the latter could tell Rabbi Halevi really wanted to be lenient as much as possible, and so even when he was too strict for the Reformers, they still quoted him. Secondly, Rabbi Angel’s congregation, Congregation Shearith Israel in NYC, used to associate with such rabbis as Sabato Morais and Henry Pereira Mendes, who both taught at JTS. Rabbi Mendes in fact helped found not only Shearith Israel, but also the OU and JTS! JTS used have elements that were basically left-wing Modern Orthodox, and so it and the OU and YU were originally relatively close. JTS’s first graduate, Rabbi Dr. J. H. Hertz, was essentially left-wing Modern Orthodox, for example. And in fact, Shearith Israel considered becoming Conservative, and it was only due to the efforts of Benjamin Cardozo (yes, that Benjamin Cardozo!!) that it remained Orthodox. So history also explains how Rabbi Angel and his work could be acceptable to a right-wing Conservative or Conservadox today. He’s not your average Orthodox, is my point. And neither am I. Heck, just look at the fact that I learn history! I may as well start sneaking haskalah literature into Volozhin. I don’t really care about the actual labels themselves, as long as people realize their significance (or better, the lack thereof). A certain Rabbi Yehoshua Shapira, the head of a hesder yeshiva in the Tel-Aviv area (either Ramat-Gan or Petah Tiqwa, or somewhere thereabouts), recently came out and declared that the left-wing Religious Zionist camp in Israel (as opposed to his own right-wing Hardal/Haredi-Leumi camp) is akin to the Reform movement in Germany. Besides evincing a remarkable ignorance of history (has the left-wing Orthodox camp in Israel really moved Shabbat to Sunday or declared brit milah to be barbaric? ), Rabbi Shapira showed quite ably that the left- and right- wings of Religious Zionism are quite distant, regardless of what they want to call themselves. So I’d like to go with you, and eschew labels. Unfortunately, everything’s got to be categorized, and if you don’t create your own label, someone else will do so for you. There’s no escaping it. A place to everything, and everything in its place. I find as I gain confidence in the various aspects of my life, those barriers seem more external than internal, and I am more and more determined to transcend them. My latest recording project was a creative response to being in Berlin as a Jewish musician. Two of my grandparents were from Germany, before the war. As for Kol Isha — I have only attempted to write one novel so far (more of a memoir). It is based around kol isha as a metaphor, and is called “Shall I Not Sing.”.. It has a great deal to do with the fragmentation of our perceived roles in life. It is good to read about other female Jewish musicians who cannot help but let who they are culturally come across in their art and work. It’s nothing to be ashamed of, as it turns out. Thank you for your thoughtful comment. I’d love to hear more about your multi-faceted career and identity. Feel free to email me (my email address is on the bio page of my blog). I’m going to check out your MySpace page! Pat Benatar Jewish? Who knew?? ?